Avril celebrated her 30th birthday in style last night at The Bank in Las Vegas. Looking positively radiant (and sun kissed!) in a pink dress, she was all smiles with sister in law Amie, girl friends like Caryn and makeup artist Gabe. This is the most beautiful I have seen her look in a long time. 30 looks good on you Avril! Happy Birthday to a girl who doesn't look a day over 20. Avril, you have accomplished so much in your short 30 years, you are an inspiration! I hope this year brings you happiness and good vibes. 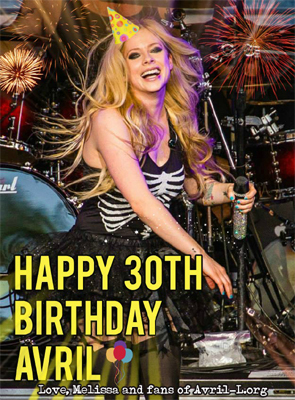 Avril will celebrate her 30th birthday this Saturday at The Bank nightclub in Las Vegas! You can be there to celebrate with her, just visit this link. As most of you know, I do not believe in posting rumors on this site because, well, it's a FAN SITE for Avril Lavigne, but everyone's been asking me: If it's true and Avril and Chad are no longer together, let's give them the space they need to work through this difficult time, without judgement. They are people too and deserve the utmost respect from us. Avril has been nominated by the fans as "Best Canadian Act" at the 2014 European Music Awards! Vote for her (over and over) HERE. It's that time of year again, and The Avril Lavigne Foundation is looking for us to help support athletes at the Special Olympics World Games. Go here to find out how you can help with this great cause! Avril and her friends were spotted leaving the Chateau Marmont in LA on August 28... wonder why she isn't wearing her wedding ring? New layout made once again by Natalie. I wanted a different, simpler design so this should be more optimized for mobile devices and easier browsing. Avril, along with tons of other celebrities, said goodbye to Chelsea Lately last night, since the host, Chelsea Handler ended her show after 7 years. Avril is seen singing with the group and you can even hear her giggle a few times. Go here to watch the cute video. Avril arriving back in Los Angeles after her Japan tour, August 20. Sorry for the slow postings... I have a new job and it's more demanding. I have less free time now, but will do my best! Rest assured, you will get the info! Avril is now off with nothing in the works, so there will probably not be too much to update anyways. Oh, and new layout coming soon! Avril has been on this mini Summer Sonic Tour of Japan for the past few days. Below are some pictures from her August 16 concert in Osaka.